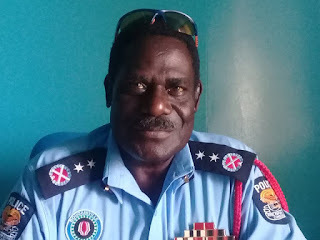 The Commissioner for the Bougainville Police Service, FRANCIS TOKURA today paid tribute to the late Police Officer Senior Constable X-SAVIOUR KANARE who passed away last Friday night in his house in Buin town. Commissioner TOKURA told New Dawn FM that he was saddened that the officer who served the Police service for more than nineteen years should end up this way. He said his death is suspicious and Police has started investigating the cause of his death. The Police Commissioner said that his body was brought to the Buka Hospital morgue for Doctors to carry out further investigations on his death before his body is brought home to Bogisago village in the Konnou Constituency for burial this week. Commissioner TOKURA said that the late Senior Constable KANARE was a reliable worker who served the Police service with distinction and his death is a loss to the Bougainville Police service.